Rockman Corner: The Choice Is Yours: Punt Or Pet? The Choice Is Yours: Punt Or Pet? If you've got, literally, ten seconds to spare, by all means give the game a spin here! Feel free to post your high scores in the comments... honesty is an admirable quality, mind you. I'm an S-class Goody Two Shoes Pirate, apparently. Ah, this game is awesome for what it is. My highest score so far was around 54. I'm bad at making snap judgements, but I still have fun. Protip: Kick the Reaverbot for extra points! I got a 68 ;w; S-Class Goody Two Shoes...Pirate? 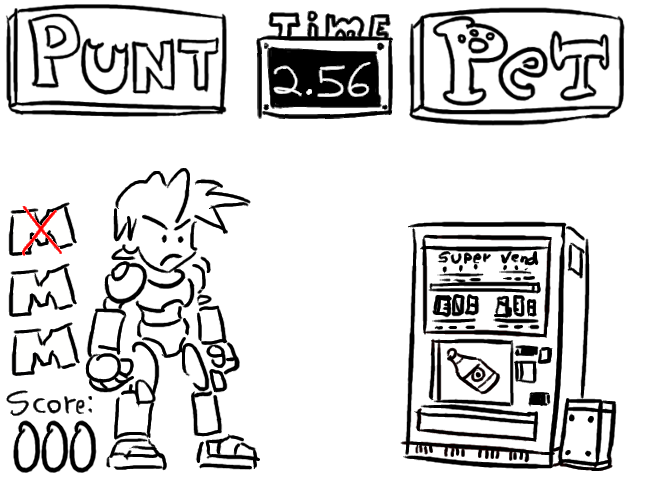 you can do combos aparently like kickin a vending machine and then drink inmediatly, or pet Roll and then kick Data. B-class Mega Monkey. Fsck yeah. I got 73 - S-class Goody 2shoes Pirate. Now I have to see about the "combos" someone mentioned. The "pet" options seem to be higher than the "punt" ones, so it's safer to leave your mouse hovering over that option. Pet Roll but when Data is petted (the real one of course not a fake-bomb one) Kick him. 65 points. S-Class Goody-2-Shows pirate. If the actual game is addicting as this one... then I won't be leaving my 3ds for several years. I don't get the game. got zero marks, see lots of bins, can't click punt or pet, and megaman just stay still. And thaks for the combos tip, guys. 110, Goody 2-Shoes Legend. I got it before the weekend.